Taipei-based research institute MIC (Market Intelligence & Consulting Institute) conducted a research study on 902 AI startups worldwide that are closely followed by investors on AngelList. 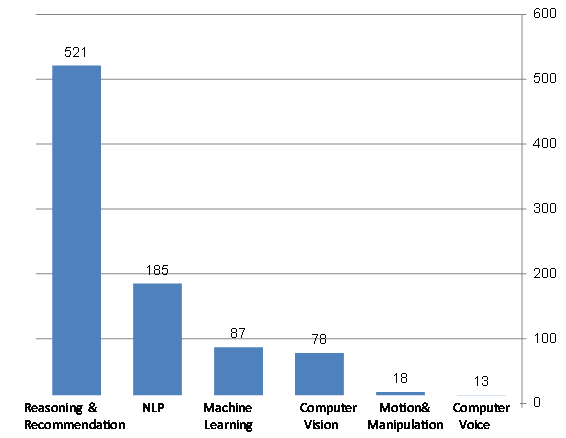 Based on the scope of technologies and fields of applications, 902 AI startups were categorized into six areas: Reasoning and Recommendation, NLP (Natural Language Processing), Machine Learning, Computer Vision, Motion & Manipulation, and Computer Voice. "The findings reveal that reasoning and recommendation is by far the most-active area with a total of 502 companies. NLP ranks second with a total of 185 companies, followed by 87 in machine learning, 78 in computer vision, 18 in motion and manipulation, and 13 in computer voice, respectively," says Ray Han, industry analyst with MIC.